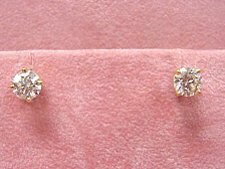 0.56CT TW of F Color, VS2 Clarity, PREMIUM cut diamond earrings. 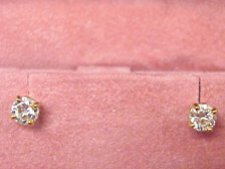 We select our diamonds to make a perfect matched pair and sell our diamond stud earrings by EXACT DIAMOND CARAT WEIGHT! Give her the best! 0.58CT TW PREMIUM cut round brilliant diamond of F Color, VS2 Clarity. These beauties are mounted in 14K yellow gold, four prong heavy weight baskets with friction backs. 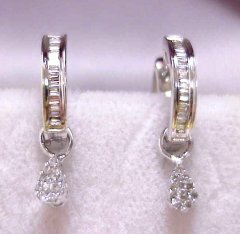 0.42CT TW diamond baguette earrings with drops that add a little extra to these beautiful earrings. Set in 14KW gold with hinged backs. Are diamonds are hand selected to ensure our high standards. How Diamond Color is determined! Diamond color is determined by an industry accepted grading-color scale standard established by both the Gemological Institute of America (G.I.A.) and the American Gemological Society (A.G.S.). Our competitors price: Guessing it?